"This plus grilled cheese sandwiches equals love!" Bring 1/2 cup broth to a boil in a pot; reduce heat and simmer. Add onion and garlic and simmer until onion is translucent and tender, about 5 minutes. Stir coriander, cinnamon, turmeric, garam masala, and cayenne pepper into onion mixture; simmer for 1 minute. Stir lentils into spiced onion mixture; cook, stirring constantly, for 30 seconds. Add remaining 3 1/2 cups broth and tomatoes; bring to a boil. Reduce heat to low, cover, and simmer until lentils are tender, 10 to 12 minutes. 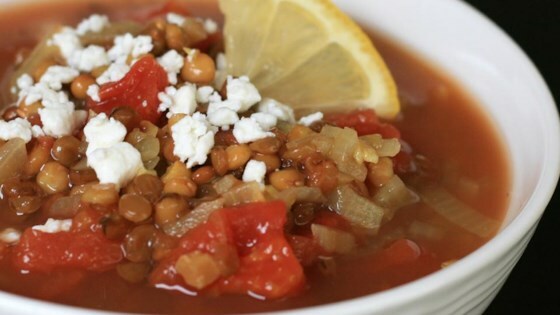 Stir lemon juice into soup and garnish with feta cheese. Tried it and it wasn’t for us... I truly love Indian food too ??????? Great flavor! Nice and spicey, the right amount of spice too! I was alittle nervous with so much cinnamon but it was perfect. Now I will make some scones to have with this soup. I used green lentils and increased the cooking time otherwise I followed the recipe. Delicious! I didn’t have the garam masala but substituted a little ground cloves, nutmeg, pepper and a bay leaf. Very interesting flavor and unique. I enjoyed and will make again!